The Naked Spur derives its dramatic currency from an ever-shifting moral centre. Consumed by the desire to buy back the farm he lost to a faithless woman, Kemp sees Ben purely as expedient, “a sack of money” with which to secure the future. Notice how he gratuitously rattles coins under Jesse’s nose to enlist his help, while the name “van-der-groat” underlines the Ryan character’s function in a film that is plainly more interested in the travails of James Stewart. Of Jesse and Roy, Kemp feels nothing but suspicion and resentment that he must share the bounty. As John Saunders points out, the bounty hunter was a relatively new figure in the western at the time, and actor and director make the most of Kemp’s moral ambivalence (3). “Quit acting like we was friends!” he yells at his confederates. It could be Stewart telling his audience not to rely on past acquaintance. Ben and Lina’s whispered escape ploy in the dark cave remains a concentrated statement of the film’s shifting allegiances; her wavering between betraying Ben and cultivating Kemp, we torn between seeing Ben as a raffish but likeable outlaw, and as a vicious unprincipled killer. Played by veteran actor Millard Mitchell, crusty representative of a simpler age, Jesse has spent his whole life going here, digging there, wherever a man told him gold and the good life could be found. The tragic consequence of moral equivalence and straitened actions, the old man’s death is still shocking, reminding us that Mitchell himself died that year. In an earlier moment over which Jesse had brief control, even his words “It’s gettin’ so I don’t know which way to point this no more” bespeak the spectator’s ambivalence about the characters in a genre that has for decades been the proving ground for the right thing to do. The Mann westerns have a maturity about them that anticipates the grubbiness and bloodletting of the spaghetti cycle and Sam Peckinpah’s work to come. The Naked Spur was shot in the Durango peaks, and the landscape through which this ragtag community passes is undeniably beautiful. But it is also hard on skin and bone. As Allen Eyles writes, Stewart comes into brutal conflict with rocks and hard ground and it is clearly the actor rather than his double that suffers here (4). Shot in the leg by Indians, Kemp spends much of the time faint from loss of blood. Never does this posse reach civilisation. It is as though their grave dispute emerges from and belongs amidst the brute facticity of earth, water and sky rather than amongst crowded streets and saloons. When Howie tells Lina the story of Mary, the woman who betrayed him, rain dripping on an assortment of metal plates and cups makes a strange melody in the night. Ultimately, The Naked Spur is driven by an absent, conniving woman. 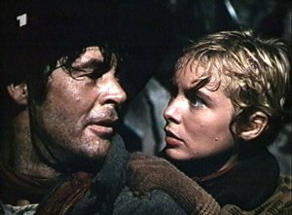 Immature, a little tomboyish, Lina is not yet a woman herself, making dubious her relationship with Vandergroat: “Sometimes I think you just like to be rubbed.” Driven to react to events rather than act on them, but eventually insufficient to his ethical degradation, Kemp becomes like the hunted hero of film noir, a genre in which powerful men are duped by women. Awaking from a nightmare, he shrieks in pain and delirium. Only Indians or women shriek like that in westerns, a genre in which white males embody traditional manliness. As in other Stewart-Mann westerns, the psychosis is symptomatic of masculine insufficiency, a malaise associated with film noir, in the ’50s reaching its baroque phase. Indeed, film noir resonates here at the level of both content and iconography. If Mann’s moral universe seems fraught, shades of grey rather than complexions we can root for, its faces look across generic fault-lines. In two years’ time, Meeker will become Mike Hammer in Kiss Me Deadly (Robert Aldrich, 1955). In five years, Leigh will be Susan Vargas in Touch of Evil (Orson Welles, 1958), two key film noirs. While Mann himself was briefly associated with film noir – Desperate, Railroaded, T-Men, Raw Deal (1947-48) – Ryan’s casual violence plotted the genre’s bitter wartime legacy. If The Naked Spur muddies the ethical waters of the traditional western, its rigorous exploration of the imperatives that impede decency and honour in an uncertain Cold War period looks forward to the pared-down gunfights and laconic discourse of Sergio Leone and Clint Eastwood. The film’s regular re-appearance on daytime TV schedules worldwide testifies both to its modernity and to its compelling and singular trajectory. The Naked Spur is pivotal: drawing a line forever beneath Stewart’s beneficent drawl, and foretelling the bloody revisions of the post-classical horse opera. André Bazin, “The Evolution of the Western,” What is Cinema? Vol. II, University of California Press, Berkeley, 1972, p. 156. Phil Hardy, The Western (London: Aurum Press, London, 1995, p. 225. There is a very good short essay on The Naked Spur in John Saunders’ The Western Genre: From Lordsburg to Big Whiskey, Wallflower Press, London, 2001, pp 46–54. Allen Eyles, James Stewart, W.H. Allen, London, 1984, p. 111.